The Memorial commemorates nearly 150,000 Scottish casualties in the 1914-18 War and over 50,000 in the 1939-45 War and campaigns since 1945. The architect Sir Robert Lorimer and 200 Scottish craftsmen transformed a barrack block into a Hall of Honour, a place of record where the names of the dead are on permanent display. Every branch of the armed services and their civilian auxiliaries is represented. 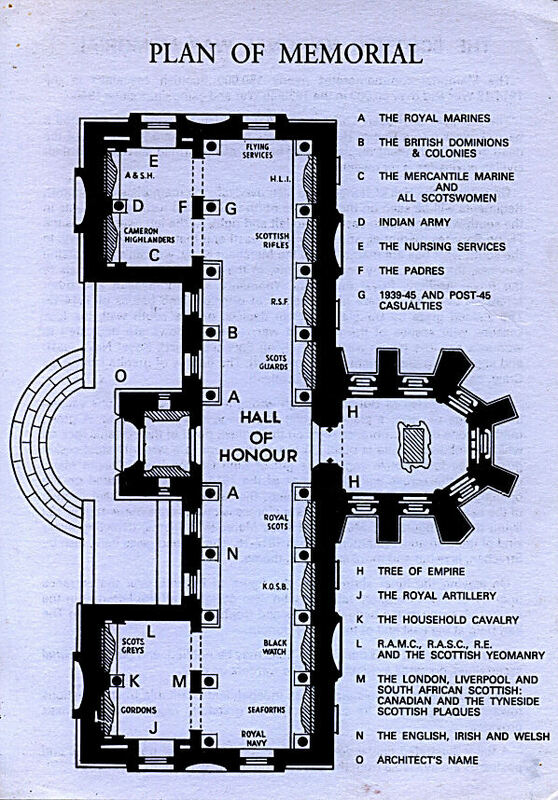 On entering the Hall of Honour (see plan overleaf), the memorials of 8 Scottish Regiments will be seen on the opposite north wall, with 4 further Regiments in the south-west and south-east bays to left and right. At the left (west) end is the Flying Services memorial, and at the right (east) end that of the Royal Navy. In the south-west bay are memorials to the Merchant Navy, women's and nursing services, the Indian Army and Chaplains; in the south-east bay, memorials to the Royal Artillery, Royal Engineers, Yeomanry, Commonwealth and other forces. Above runs a frieze of the names of principal land battles of 1914-18. The stained glass by Douglas Strachan depicts, on the south wall, the four seasons with scenes of the nation at war; other windows are dedicated to women's services (south-west bay), Flying Services (west), Royal Navy (east) and engineering and armaments (south-east). The floor is of granite from Ailsa Craig, an island off the west coast of Scotland. North of the Hall of Honour through wrought-iron gates is a stone-vaulted inner shrine or apse, a place of quiet pilgrimage and thanksgiving. A green marble stone of remembrance rests on the highest point of the volcanic rock on which Edinburgh Castle is built. On top of the stone is a wrought-steel casket guarded by four bronze angels, the gift of King George V and Queen Mary, containing the scrolls with the names of the 1914-18 dead deposited on the opening day in 1927. Over the casket hangs the oak figure of St Michael, captain of the heavenly host. Round the walls is a processional bronze frieze of over 100 living portrait figures by Morris and Alice Meredith Williams, depicting every kind of uniform and equipment used in 1914-18. The stained glass here, also by Strachan, is richer and more spiritual in theme. On leaving the inner shrine, note the figure of Reveille over the entrance door by C. d'O. Pilkington Jackson, who also designed all the lettering in the memorial, many of the badges, shields and trophies, and the medallion to The Earl Haig at the east end of the Hall of Honour. Amendments and omissions to the Rolls may be notified, and places of burial ascertained, on cards available from the warders on duty. The Memorial is administered by an independent charitable trust. Donations towards the upkeep of its contents will be gratefully received in the boxes provided. A fuller illustrated guidebook and other literature, colour transparencies and postcards are available from the Castle Shop on the way out of the Castle.